Post from the international website of The Awesome Foundation. Awesome Foundation – Calgary’s November 2012 Winning Project ‘Make Fashion’ Set to Dazzle and Delight Again! An Awesome Foundation – Calgary winning project for November 2012, last year’s Make Fashion 2013 gala in Calgary was a complete success! It brought local technology enthusiasts and engineers together with fashion designers to create innovative artistic pieces that demonstrated the convergence of fashion and technology. AF-Calgary’s $1,000 micro-grant helped kickstart the creation of various pieces of wearable technology for the show through the purchase of materials, ultimately contributing to roughly 10% of all the pieces created last year. The inaugural Make Fashion gala became the first of its kind anywhere in Canada, joining FashionWare at CES and the wearable fashion show organized by Tech in Motion: New York as one of the premier events in North America showcasing the convergence of high technology and high fashion. In fact, local designers Laura Dempsey and Angela Dale were invited to show the pieces they developed for Calgary’s Make Fashion 2013 gala at this year’s FashionWare event in Las Vegas last month. What makes Make Fashion different from shows like FashionWare and the Tech in Motion: New York wearable fashion show is that Make Fashion funds a significant portion of the development costs for the pieces designed for the gala, up to $1,500 worth for each piece. Last year’s Make Fashion gala consisted of design teams mainly from the Calgary area, but this year, three top designers from outside of North America have been invited to showcase their wearable technology pieces at Make Fashion 2014. The international designers headlining this year’s gala include Erina Kashihara from Japan, who has been creating light accessories and dresses since 1985, London, UK based artist Rainbow Winters, who fuses cutting edge science with the high-art of fashion to create visually stunning pieces that have been showcased in music videos, rock-concerts, advertisements, and other red-carpet events, and Dr. Patricia Flanagan, Head of the Wearables Lab at the Academy of Visual Arts at Hong Kong Baptist University. Along with 11 returning and emerging design teams from the Calgary area, Make Fashion 2014 aims to be the biggest and best show to date with a larger venue and more exhibits. When: Saturday, March 1, 2014 from 7 p.m. to 10:30 p.m.
Make Fashion is an initiative that introduces talented local designers to cutting edge new technologies, subject matter experts, and wearable technology. We are a collaboration of great minds who want to explore and demonstrate the convergence fashion and technology. From awe-inspiring responsive runway dresses to scientific wearables with practical applications, Make Fashion designers are inspired by fashion with functionality. Our runway gala in Calgary, Alberta is our largest annual event, where we pair fashion designers and artists with engineers and tech enthusiasts. The combination of skills and ideas creates stunning results and groundbreaking fusions of light, fashion and performance. In addition to our runway series, Make Fashion produces a series of thought leadership symposiums, public-access workshops, and molecular cocktail events. For more information, please visit makefashion.ca. 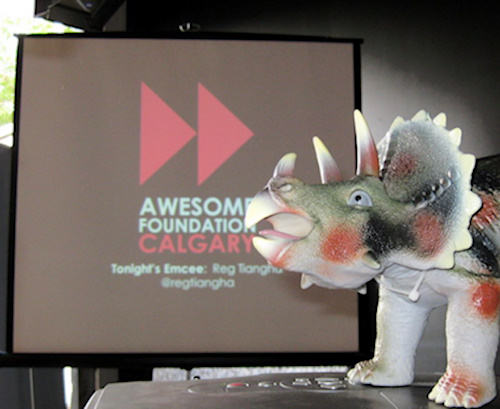 The Calgary chapter of The Awesome Foundation (Awesome Calgary) was created in April 2011 and to date has granted $27,000 in no-strings-attached $1,000 micro-grants to enable awesomeness in Calgary. As part of the international Awesome Foundation network, collectively, $873,000 by 89 AF chapters in 18 countries has been granted to inspire and enable awesomeness around the world. For more information, please visit awesomecalgary.org. A local group of 3D printing enthusiasts have teamed up with Internationally renowned artist Jeff de Boer to create Linked, the world’s first crowdsourced 3D sculpture, set to debut in Calgary this September, and they’ve won Awesome Foundation – Calgary’s 27th $1,000 micro-grant to help them do so. Linked will be the world’s first crowdsourced 3D printed sculputre. Unique medallions 3D printed around the world will be assembled into a hanging mesh, which will form a mosaic representing the intersection of art and engineering. 3D Printer owners from around the world are invited to personalize an interconnecting medallion design and ship their contribution to Calgary. Contributors are encouraged to show off their logo, equipment, materials and 3D modelling skill, and are invited to submit as many different designs as they like. Tom Bielecki (24), James Thorne (22) and Kaz Walker (23) of Print-to-Peer, a local 3D printing startup, will provide the 3D printing expertise for the sculpture, and pitched to Awesome Calgary on behalf of the project. “We’re able to take our artist’s vision and allow anyone in the world with this technology to be the sculptor. We’re excited to demonstrate the endless possibilities and limitless creativity of the community,” says Tom. Awesome Calgary’s $1,000 no-strings-attached micro-grant will go towards the creation and construction of the frame needed to hold the pieces together and to transport the sculpture from one venue to another. This includes the materials, art and labour needed to build the frame. The entire package will debut in Calgary this September as part of Calgary Mini Maker Faire and Beakerhead, September 14 and 15, 2013. 3D Printing enthusiasts around the world are encouraged to contribute. Interested parties can register at http://www.printtopeer.com/sculpture where they will be automatically assigned a customized piece of the sculpture, which they can further modify with any image. More technically inclined participants can also download a plain medallion and use computer-aided design software to customize it themselves. These pieces would then need to be mailed back to Calgary in time for inclusion in the sculpture’s debut in September. One in five Canadian moms struggle to provide clean diapers for their children. Kristina Prins has organized a city-wide diaper drive to address the need and bring awareness to the issue, and she has won Awesome Foundation – Calgary’s $1,000 no-strings-attached micro-grant for March 2013. For families who struggle financially to make ends meet, providing clean diapers for their newborns is just one more thing to worry about. Some families have to sacrifice necessities in order to afford new diapers, and some babies are kept in soiled diapers for extended periods of time in order to cope, increasing the baby’s risk of infections. The average baby will use 2,800 diapers in their first year alone, costing an average of $850. Furthermore, daycare facilities often will not accept children without a full day’s supply of disposable diapers, which further increases the pressure on families in need. The Calgary Food Bank provided 15,000 one-week emergency hampers with seven diapers per hamper (less than one day’s worth) to families in need in 2012. However, the Food Bank relies solely on diaper donations from the public because it isn’t currently in their mandate to use their funding towards that purpose (any money they receive primarily must go towards food). In order to provide a week’s supply of diapers in each hamper, the Food Bank would need $10,000 in diapers per year. In order to raise awareness of the issue that some families face in Calgary and to help address the need in the city, Kristina has organized a city-wide diaper drive to assist the Food Bank in gathering these critical materials and to help those families who are in difficult circumstances. The Bare Bottoms Diaper Drive is entirely self-funded from Kristina’s own pockets. The Awesome Foundation’s $1,000 will help Kristina promote the initiative in the hopes that Calgarians will rally and contribute towards the cause, either by donating to her diaper drive, or by encouraging others to start their own diaper collections. The funding would be used on the creation of promotional materials and posters to help get the word out, and on other materials needed to run the diaper drive. Any left over funds would go towards purchasing fresh diapers for the Food Bank. If you’re in the Calgary area and want to contribute, you can donate diapers or dollars at the Calgary Zoo (donation bins will be set up near the Penguin Plunge exhibit on the North end of the Zoo) during Mother’s Day weekend (May 11 and 12, 2013) from 9 a.m. to 5 p.m. and you’ll receive a 2 for 1 admission for a future visit to the Zoo for doing so. All sizes of disposable diapers are needed, particularly sizes 5 and 6, and new or opened packages will be accepted. Donations will also be accepted year-round at the Calgary Food Bank, Food Bank donation stations, and at all Community Health Centres (Shaganappi, South and North West Community Centres have year round collections). Finally, if you’d like to volunteer to help with Kristina’s diaper drive, learn more about the program, or learn more about how to start your own diaper collection, contact Kristina on Facebook, Twitter or by email. Calgary has a demolition addiction and a collective of local artists striving to transform 11 houses scheduled for destruction into wonderful pieces of temporary art has won Awesome Foundation – Calgary’s February 2013 $1,000 micro-grant. In May 2013, eleven houses will be demolished on 5th Avenue in the Calgary neighbourhood of Sunnyside to make way for one dense apartment block. WRECK CITY: An Epilogue for 809 is an optimistic experiment which will pay tribute to the history of the spaces and the lives lived within the homes. Instigated as an epilogue for the 809 Gallery, one of Calgary’s most influential pop-up garage galleries (and also scheduled for demolition), eight artist-curators representing some of Calgary’s best and rising stars in the local arts and culture scene will invite over 30 artists, musicians and performers to participate in the project. With the blessing of the housing developers themselves, they will be free to radically alter the architecture of entire homes, reshaping and reusing materials without the need for repair at the end of the project. The ensemble of artist-curators behind WRECK CITY include Matthew Bouree, Caitlind r.c. Brown, Jennifer Crighton, Brandon Dalmer, Andrew Frosst, John Frosst, Shawn Mankowske and Ryan Scott. Together they have founded galleries, run festivals, instigated long-term collectives and have toured made-in-Calgary art around the world. After a month of work transforming the homes, the temporary art displays will be open to the public for viewing between April 19 and 27. Shortly after the nine days of exhibition, the houses will be demolished. WRECK CITY is entirely self-funded from the curator’s own pockets, and Awesome Calgary’s $1,000 no-strings-attached micro-grant will enable them to cover the insurance needed for such an event, as well as a portion of the hardware and promotional materials, allowing the collective to focus the majority of their efforts on showcasing the potential of re-using domestic spaces in Calgary prior to redevelopment. To follow the progress of WRECK CITY as it progresses towards its April debut, make sure to check out their website. And to see who else the folks over at WRECK CITY were up against this month, relive our Thousand Dollar Thursday event over on Storify. Highlights include mountain biking kids, puppet buses and more kids playing it forward through the power of sport! Awesome Foundation – Calgary’s January 2013 $1,000 micro-grant went to Neil Egsgard with Kensington Interaction, a space built by Neil to showcase knowledge and to connect community in the Calgary neighbourhood of Sunnyside. Based on the concepts of constructive communication and respect, Kensington Interaction is a public display space and message board where information from the neighbourhood and art from local artists can be found and seen by the thousands of Calgarians who live in the region and commute through it everyday due to its visibility in a high traffic area. AF-Calgary’s $1,000 will allow Neil to take his space to the next level by creating four new displays containing a wide variety of knowledge such as how to effectively choose food from various providers based on knowledge provided by local chefs and health/fitness professionals, presentation of Governor General award-winning research on conflict resolution in African refugee camps provided by a local scholar, and finally, showcasing local art and stories created by local artists. You can check out video of Neil’s 90 second pitch at our January 2013 Awesome Calgary Thousand Dollar Thursday event on Telly.com here. If you’re in the Calgary area, be on the look out in Kensington for the new displays coming soon, or visit the space now to see what is currently being showcased. Another four great ideas were showcased at our January Awesome Calgary Thousand Dollar Thursday event. To relive the all the action, check out <a href="
After taking a small break for the holidays, AF-Calgary returned to award another $1,000 micro-grant to an Awesome Idea for the month of January. Awesome Foundation – Calgary’s final $1,000 micro-grant before the Mayan Apocalypse went to Shannon Hoover and MakeFashion, a collaboration of great minds who want to demonstrate that the convergence of Technology and Art can result in a form, fashion and community brand new to Calgary. According to Shannon, Calgary has an image problem. To much of the world, we’re considered to be a city of oil barons and cowboys but to those of us who live here, we know that it simply isn’t true. We’re a young city of highly-educated entrepreneurs with a culture of getting things done and we’re starting to come into our own, culturally speaking. This leads to opportunity. The MakeFashion initiative seeks to merge technology and fashion, utilizing our city’s technical strengths by bringing together tech-savvy programers, engineers and fashion designers with the goals of showcasing the true innovative spirit and creativity that Calgary has to the world. Artists and designers often find that they have to leave Calgary to find work. MakeFashion is working to change that by creating a project that will encourage emerging youth to find inspiring work right here in our city. MakeFashion wants to give Calgary a leg-up and the people working in this market a head start in the next evolution of computing, wearable technology. Within the initiative, all of the time spent by the engineers and designers is donated, so 100% of AF-Calgary’s $1,000 no-strings-attached micro-grant would be used to purchase the raw materials and electronics for the designers to use in their amazing creations. MakeFashion is holding a kick-off event on Friday, January 25, 2013 at Endeavor Arts and Event Space and all are invited to attend. For more details, see here. Love padlocks and an End of the World bash were a couple of the other ideas vying for November’s $1,000 micro-grant at Awesome Calgary’s Thousand Dollar Thursday. To relive the night’s event, keep an eye on our blog or read about it on <a href="
The FINAL Awesome Calgary Thousand Dollar Thursday before the Mayan Apocalypse (also known as November 2012’s AF-Calgary Pitch Night) was held at the Central branch of the Calgary Public Library, in partnership with the library’s “One Book, One Calgary” program. Awesome Foundation – Calgary goes retro, lumberjack style, as we’re pleased to announce that Karilynn Thompson is our $1,000 micro-grant recipient for the month of October with The 2nd Annual Log Driver’s Waltz: A Plaid Party!. The 2nd Annual Log Driver’s Waltz: A Plaid Party! is a wholesome plaid-themed party hearkening to the days of National Film Board animations on CBC television in the 1960s. The Log Driver’s Waltz Gala is named after the iconic NFB short Log Driver’s Waltz created in 1979. The gala is a family-friendly event featuring GIANT five-storey tall retro-animations shown on the side of the Southern Alberta Jubilee Auditorium, fire-pits, hot chocolate, DJs, honky-tonk bands, food trucks and much, much more. You can even learn some basic animation techniques yourself courtesy of workshops happening that evening too. As a part of the GIRAF Animation Festival by the Quickdraw Animation Society, this event creates an excuse for families and friends to get together over a burn barrel, roast marshmallows and watch nearly-forgotten animations, all of which are important parts of Canadiana. AF-Calgary’s $1,000 micro-grant will allow Karilynn to rent the 35,000 lumens projector needed to display the animated shorts on the side of the auditorium. By using the money to cover equipment costs, Karilynn can ensure that the gala’s expenses remain low and that the Plaid Party remains a free or low-cost event for all Calgarians to enjoy. If you’re in the Calgary area, the 2nd Annual Log Driver’s Waltz takes place outside the Southern Alberta Jubilee Auditorium (1415 14 Ave NW) in the north lobby and parking lot on Sunday, November 4 from 7 p.m. to midnight. It’s an all-ages event, so make sure you wear your best plaid and get set to enjoy some retro Canadiana cartoons! Four great ideas were pitched to the AF-Calgary Trustees at our October Awesome Calgary Thousand Dollar Thursday Pitch Night event, including a nice serenade by a saxophonist courtesy of the Westwinds Music Society. To see what other kinds of Awesomeness were on display that night, check out our recap on <a href="
Awesome Foundation – Calgary’s Thousand Dollar Thursday event for October 2012 took place at Mount Royal University in the main study area of the Bissett School of Business. The winner of Awesome Foundation – Calgary’s SUPER SPECIAL September $1,000 no-strings-attached micro-grant is Natalie Meisner with PODPLAYS: Downloadable Art for Your Ears. Natalie is a playwright and poet from Nova Scotia and an Associate Professor of English Literature at Calgary’s Mount Royal University where she teaches and researches creative writing, drama, Canadian literature and theories of comedy and laughter. Created by Natalie and her students, these free PODPLAYS are downloadable audio plays designed specifically for your ears that anyone can access. Some are best listened to in a certain location or site, some ask you to be a spectator on the move and listen while you walk or run a certain route, and some ask you to simply download, plug in your earphones, and close your eyes. PODPLAYS aims to bring awareness to unused or neglected spaces in the Calgary city core to the public. The project would also allow Natalie’s students first-hand experience working with professional directors and actors as they develop the PODPLAYS for public consumption. The entirety of the $1,000 micro-grant will go towards hiring actors and directors instead of being spent on props and other high cost items. Any leftover money will go towards promotion of the project. Keep an eye on Natalie’s website www.PODPLAYS.ca where you’ll be able to access the free downloadable PODPLAYS and can learn more about the project and how you can participate. September 2012 was a SUPER SPECIAL month here at AF-Calgary as we held our Awesome Calgary Thousand Dollar Thursday event on the last Saturday of the month (rather than the fourth Thursday of the month) to coincide with Alberta Culture Days and a whole whackload of other events happening in town (We Should Know Each Other #100 and Doors Open YYC Naked, just to name a couple). To learn more about how this special event unfolded, check out our full recap on our blog and on <a href="
September 2012’s Awesome Calgary Thousand Dollar Thursday was SUPER SPECIAL, taking place on a Saturday rather than the normal fourth-Thursday-of-the-month to coincide with Alberta Culture Days, Doors Open at King Edward, and the milestone We Should Know Each Other #100! A project to create an 18-foot interactive electrical CLOUD created out of 5000+ incandescent light bulbs has won Awesome Foundation – Calgary’s $1,000 grant for the month of August. Entitled CLOUD, this interactive art project by Caitlind r.c. Brown will allow the public to wander beneath an installation representing a giant cloud created out of light bulbs through a rain of pull strings allowing them to switch on and off lights to create the illusion of lightning on the cloud’s surface. Visiting CLOUD will be free, open to the public and kid friendly. Scheduled to debut at Calgary’s very first Nuit Blanche festival on September 15, 2012, the project is far short of their goal of collecting at least 5000 light bulbs, used or new, to use in the creation of the installation. To date, they’ve only collected around 300. To help meet their goal, they desperately need the help of the public. As existing funding for the project may not be adequate enough to cover the light bulb shortfall, AF-Calgary’s $1,000 will go towards a massive promotional campaign to build awareness of the project and to urge the public to donate any used or new incandescent light bulbs that they would be willing to part with. Funds would go towards purchasing ads in local newspapers and other avenues and channels that those not typically interested in the arts would frequent, as the arts community in Calgary is most likely already aware of the endeavor. Any unused money would go towards purchasing new light bulbs to help make up the short fall. For any Calgarians wishing to donate their used (or new) incandescent light bulbs, a collection box has been set up in the front lobby of the Alberta College of Art and Design (1407 – 14 Avenue NW) where people can drop off their new or used incandescent light bulbs at any time. For companies, businesses or people with lots of light bulbs that they may wish to donate, they are encouraged to contact Caitlind directly where she will be happy to pick them up. To learn more about the types of bulbs Caitlind is looking for, see here. You can learn more about CLOUD as well as follow the progress of Caitlind’s project on her blog at incandescentcloud.wordpress.com. And if you’re in Calgary on Saturday, September 15, 2012, make sure to check out Calgary’s first ever Nuit Blanche at Olympic Plaza Park from 7 p.m. to 3 a.m.
Live Art Battles, comedy/improv and kids in Scottish kilts were among some of the competition that Caitlind had to face at this month’s Awesome Calgary Thousand Dollar Thursday. For all the details, check out the recap on our blog. Awesome Foundation – Calgary is pleased to announce that the 15th grant in our chapter’s history went to Ashleigh Ahern and her Buying Local Project. Ashleigh will use the $1,000 micro-grant to create a video blog series spotlighting local businesses that are green or sustainable giving them exposure, public awareness and encouraging people in Calgary to support all local businesses and vendors in the city who strive to be green and sustainable. Ashleigh’s goal is to produce at least one video spotlight per month, and Ashleigh has already produced her first video spotlighting Hoven Farms at the Kingsland Farmer’s Market, which you can see below. Keep an eye on Ashleigh’s Blog for more videos in the series as they are produced. With three other well thought out ideas, Ashleigh faced some tough competition in June. For more details on how our Awesome Calgary Thousand Dollar Thursday event went, check out the recap on our blog.